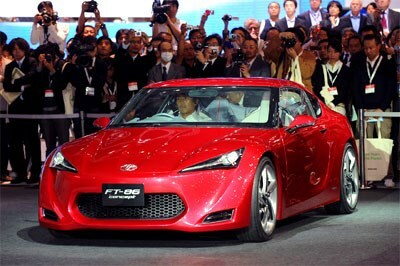 The 41st running of the Tokyo Motor Show, which opened its doors this week, suggests it is not all business as usual for the Japanese car industry. All the glitz and glamour was packed away at this severely depleted '09 show, Where stands were once a hive of activity, there were now wide empty spaces and Lotus, Caterham Cars and Alpina were the only foreign brands present. Yes, these are hard times for the Japanese economy and car industry. All the more reason you'd suppose to push the button on a strong, upbeat show to try to get things moving again. But no. Japan's logic this time was to set up a 'quiet' show, at a time when even the biggest players (Toyota and Nissan) are in the red and there have been many factory layoffs. So this was a sober, K rations expo with eco and curbing emissions very much the overriding theme. So this was the cue for a big swag of electric and hybrid cars, led by the Nissan Leaf, the electric Golf-class hatch that will start production next year. Toyota (FT-EVII) and Honda (EV-N) also displayed small electric concepts and again, so did Nissan, with the curious, tilting Land Cruiser with tandem seating. Honda unveiled a 95 per cent version of its keenly awaited 1.5-litre CR-Z hybrid coupe and showed the Skydeck, an attractive, Insight-based 6-seat MPV. Mazda, like Daihatsu, believes that by clever use of existing tech and cutting body weight you can improve economy and C02 without resorting to hybrids. Subaru's Hybrid Tourer, an upscale four-seat wagon concept, provides clues to Subaru's coming design language and debuts a clever new twin-motor hybrid system that Subaru insists is all its own work. But for petrolheads, it was Toyota's vast stand that had the goodies. Out came the Toyobaru, alias the FT-86 concept (top), the rakish rear-drive coupe with Subaru-flat four engine, Then across the way, the first official sighting of the long awaited 412 kW, 4.8-litre V10 two-seat Lexus LFA coupe. Only 500-off, with Lexus asking a cool A$446,300 for each one. Despite the sedate atmosphere, the Tokyo Show proved again that Japan can certainly still turn it on, when it wants to.